Giving IT professionals in financial services firms a rounded and comprehensive grounding in their knowledge of their industry, this book offers a primer on the major financial instruments, transactions, and processes, as well as a sound knowledge of the principles of good IT management in the industry. The book gives readers a clear understanding of equities, bonds, currencies, listed derivatives and OTC derivatives. It explains transactions in those instruments and the requirements of business systems that process these transactions. Transactions covered include (inter-alia) agency and principal purchases and sales, loans and deposits, repos and reverse repos, stock loans; and also the Sharia-compliant 'Islamic' transactions that may be used as alternatives to interest bearing transactions. Andrew Bradford gives an introduction to how investment firms are regulated; offers an understanding of the STP (Straight-through-Processing) concept following the trade cycle for the transactions from order through to execution through pre-settlement to final settlement; covers basic accounting procedures for the transactions; and conveys the basic principles of good IT management in the investment industry. Andrew Bradford (Cheshunt, UK) is a Consultant and an Associate of the Securities and Investment Institute with expertise and background in back office operations, and systems analysis. He has contributed articles to a wide range of financial industry periodicals published in the UK, Europe and the United States including STP Magazine, Derivatives Report, Funds Europe, Journal of Securities Operations, Wall Street and Technology, Trading Technology Week and Futures & Options World. Andrew is the author of the SII IAQ Workbook IT in Investment Operations published in May 2007. Currently a freelance consultant, he has held positions in IT, Operations and Marketing for Merrill Lynch, ABN Amro, Sanwa Bank and ACT Financial Systems. PART ONE: INVESTMENTS AND SECURITIES EXPLAINED. 1 An Introduction to Financial Instruments. 2.1 Listed and unlisted equities. 2.3 The issuance of listed equities â?? the primary market. 2.4 The secondary market in equities. 3.1 Types of debt instruments. 3.2 Accrued interest on bonds in the secondary market. 3.4 How prices are formed in the secondary market. 4.1 Cash as a means of exchange. 4.2 Cash as an investment class. 5.1 Exchange traded derivative contracts. 6 Common Attributes of Financial Instruments. 6.1 Summary of all trade terminology used in chapters 1 to 5. 6.2 Summary of basic trade arithmetic for transactions in securities, futures and options. 7.4 Private client stockbrokers and investment managers. 7.5 Investment banks that accept and execute orders from investors. 8 How Investment Firms are Regulated. 8.5 The UK perspective â?? the role of the financial services authority. 8.6 Specific offences in the United Kingdom. 8.7 Regulation and its impact on the it function. 9.2 To what extent is STP actually achieved in practice? 10 The Role of Accurate Static Data in the STP Process. 10.2 Duplication of static data across systems. 10.3 Instrument group static data. 10.5 Trading party and settlement agent static data. 10.6 Standard settlement instructions (SSIs). 10.7 Static data that is internal to the firm concerned. 10.8 Normal working days and public holidays. 11 Communications Between Industry Participants. 11.2 The financial information exchange (Fix Protocol). 12 The Trade Agreement and Settlement Processes. 12.1 The trade agreement process. 12.2 Communications between the trade party and its settlement agent. 13 Failed Trades â?? Causes, Consequences and Resolution. 13.1 Failed trades â?? causes. 13.2 Consequences of failed trades. 13.3 The prevention and resolution of failed trades and the impact on It applications. 14 An Overview of Investment Accounting. 14.1 Role of the financial control department. 15 The Stock Record â? ?Using the double-entry Convention to Control Positions and Security Quantities. 16 Example STP Flows of Equity Agency Trades â?? When Execution Venue is the London Stock Exchange. 16.2 Equity agency trades with institutional investor customers. 16.3 Equity agency trades with private investor customers. 17 The STP Flow of Debt Instrument Trades. 17.8 General ledger postings for the trade and the settlement. 17.9 Stock record postings for the trade and the settlement. 18 The STP Flow of Foreign Exchange and Money Market Trades. 19 The STP Flow of Futures and Options Transactions. 19.2 Futures and options â?? common process steps. 20 The STP Flow of SWAP and other OTC Derivative Trades. 20.4 Trade components and amounts. 20.11 Daily accrual of interest. 21 Stock Lending, Repos and Funding. 21.2 Stock Lending and borrowing transactions. 21.4 Summary of the differences between the various transaction types. 21.5 The Role of specialist lending intermediaries (SLIs). 21.6 Business Applications to support stock lending and repos. 22 The Impact of Islamic Finance. 22.2 Delivering Islamic financial services. 22.4 The valuation and risk management of Islamic financing instruments. 22.5 The It implications of providing islamic instruments. 23 The Management of Positions. 23.2 Trade dated, value dated, settled and depot positions. 23.3 Interest payments and interest rate fixings. 23.4 Collection of maturity proceeds. 23.7 Listed derivatives â?? contract expiry and delivery dates. 23.8 Marking positions to market. 24 The Management of Risk. 24.1 Forms of market risk. 24.2 Forms of credit risk. 24.3 Other forms of risk. 24.4 The role of the board of directors in managing risk. 24.5 The role of the risk management department. 24.6 An introduction to value-at-risk (VAR). 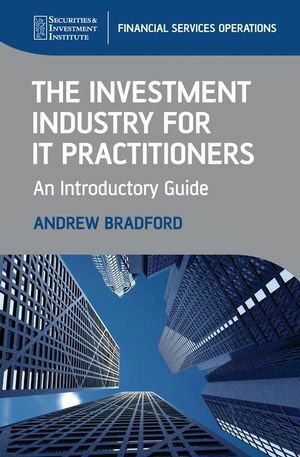 PART TWO: GOOD IT PRACTICE IN THE INVESTMENT INDUSTRY..
25 The Role of the IT Department in Daily Operations. 25.2 User support and helpdesk management. 25.3 Data security, data retention, data protection and intellectual property. 25.6 Use of the It infrastructure library in managing It operations. 26 The Role of the IT Department in Managing Business Change. 26.2 The software development lifecycle. 27 Package and Vendor Selection, Outsourcing and Offshoring. 27.1 Making the buy or build decision. 27.2 Vendor and package selection. Appendix 1 Bond Market Price Calculations. Valuation methodologies for other types of debt instrument. Appendix 2 Summary of Contractual Documents.